All plant measurements are in metric these days so we tend to work that way but we know from experience that lots of our customers can visualise plant heights and hedge lengths better in feet and yards so we hope this guide is helpful (but if you're struggling at all just give us a call and we'll do the calculations for you). When we're describing the height of a plant, we always exclude the pot or root so you are only paying for the part of the plant that will show above the soil level when it is planted. 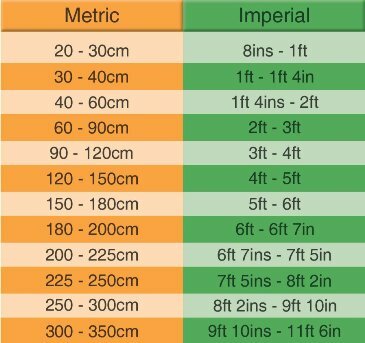 Plant heights on this website range from 10cm right up to 3 metres and more - but these are the approximate conversions into imperial measurements for up to 3m as plants above this size tend to be for bespoke projects. The values have to be approximate conversions or we'd be talking fractions of inches and that would really add to the confusion rather than simplifying it. When it comes to measuring the length of hedging you need, many customers measure in feet or yards whereas we tend to work in metres, so we thought a little conversion chart would help. Just choose your measurement in feet and it will convert your measurements into metres.